At the invitation of H.E. the President Maithripala Sirisena, His Excellency Nawaz Sharif, Prime Minister of Pakistan, will undertake an official visit to Sri Lanka from 4 to 6 January 2016. Prime Minister Nawaz Sharif and Madam Begum Kalsoom Sharif will be welcomed on their arrival at the Bandaranaike International Airport by Prime Minister Ranil Wickremesinghe. On 5th January 2016, the official welcome ceremony presided by President Maithripala Sirisena will be held at the Presidential Secretariat in Colombo. The visiting Prime Minister will be accorded a ceremonial welcome including a Gun Salute and Guard of honour. 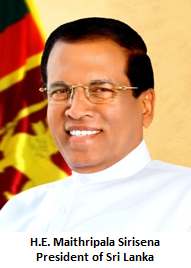 President Maithripala Sirisena will lead the Official Bilateral discussions with the visiting Prime Minister. The delegation for the talks will include Hon. Prime Minister Ranil Wickremesinghe, Cabinet Ministers and Senior Government officials. President Maithripala Sirisena will host a State Banquet and Prime Minister Ranil Wickremesinghe will host a lunch in honour of the visiting Prime Minister. Several bilateral instruments in the areas of Health, Science & Technology, Trade, Statistics, Gem & Jewellery, Money Laundering & Terrorism Financing, and Culture are envisaged to be signed during the visit. On the invitation of the Lakshman Kadirgamar Institute of International Relations and Strategic Studies (LKIIRSS), Prime Minister Nawaz Sharif will deliver a special lecture on “Sri Lanka-Pakistan Relations” at the Cinnamon Lakeside Hotel. During his stay in Sri Lanka, Prime Minister Nawaz Sharif will visit the historic city of Kandy. He will pay homage to the Sacred Tooth Relic, and will also visit a Muslim Mosque and the Jinnah Centre in Kandy. He will also visit the Peradeniya Botanical Gardens and will plant a “Karanda” tree (Pongamia pinnata) to commemorate his visit to Sri Lanka. It is recalled that President Maithripala Sirisena undertook a State visit to Pakistan from 5-7 April, 2015. Prime Minister Nawaz Sharif visited Sri Lanka in 2013 to participate in the Commonwealth Heads of State Meeting and in November 2010, President Asif Ali Zardari, paid a State visit to Sri Lanka.